• Coffee machine, pots, pans, dishes, silverware, etc. 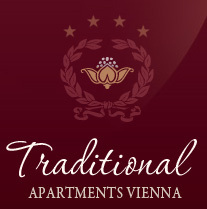 Visit our apartments and enjoy the varied life experience and the pleasant quiet which our charming city Vienna offers. For vacation booking, detailed information, prices, availability, photos, and descriptions of the holiday apartments please choose our offered apartments. To reserve please make use of our online booking calendar, write us an e-mail, or simply give us a call. Few cities in Europe charm its apartment visitors as much as Vienna. The Danube-metropolitan city that, after almost a century after the end of the monarchy, still radiates the brilliance of the Habsburg monarchy: during the time when Vienna was the center of the Central-European multiethnic and one of the most important political and cultural centres of the continent. Still today the Austrian capital captivates with a wealth of culture on offer that finds few equals to match in the world. It is not for nothing that the Viennese New-Year’s-Concerts are commonly known among music lovers over the entire world and the Viennese Opera Ball is known as the ball of balls. Since its true time of flowering in the 18th and 19th centuries, Vienna as the world’s capital of classical music the fame of which was achieved by important Austrian and German composers such as Mozart, Beethoven, Schubert, Brahms, Haydn, and the father- and son Strauss-dynasty when only mentioning the most important of those who wrote music history. Vienna, the proud city at the Danube, offers in other areas of culture, such as the fine arts, theatre, and opera, as well as the area of entertainment a great deal to its visitors. The greatest attraction, however, is the city itself. What could equal a stroll though Schönbrunn Park; what could compete with horse drawn coach ride through the gate of the Hofburg, the former residence of the Habsburg emperor, the once proudest dynasty of central Europe; and what could contend with one of the classic coffee houses, which are so plentiful in Vienna? With all of this the city of Vienna can be seen as complete work of art. Despite its rich history, Vienna remains young and has a lasting youth appeal—especially an appeal for artists and the creative sectors. And, no wonder, because where can one find better inspiration than at a place which is so rich in cultural treasures? This is how the artists continue the tradition for the Austrian capital. In order to get to know the city of Vienna in all its facets, you should spend some days in the Danube-Metropolitan. Those who are looking for accommodations away from the tiring hotel routines with lots of room for individual unfolding should rent a holiday apartment. Here you are, far from your home, “at home” and you can, during your stay, feel at home. And yet, in front of your doorstep there is one of the most attractive cities in Europe. To explore Vienna, there is no better point of departure than the centrally located yet quiet holiday homes and short-time appartments from Traditional Apartments Vienna, TAVienna. On foot or with the underground, you are a few minutes from the centre of the city. When choosing the right charming holiday apartment, we orient ourselves to your wishes. Are you looking for a cosy place for a romantic weekend stay? Then we can certainly find the right place for you. You’re planning a longer family holiday and are looking an apartment with sufficient room for the parents and children. We have the place to offer you that will satisfy you completely. You have a business appointment in Vienna and are looking for quiet apartment or accommodations where you can relax after a busy day filled with appointments. This is no problem for us, as well. Whatever your entirely personal conceptions are, we can offer you that certain place that will fulfil you expectations completely. An apartment vacation in this charming city is amazing and you will feel here at home. Enjoy Vienna – we will take care of the rest!